Red oxide is a coloured powder that is bought in tins measured per kilogram. The mason will mix this powder with the final cement screed of the floor and smooth it out. It is ideal if you want to cut on costs. If you find it not very pleasing aesthetically, you can always cover it up with a carpet. This flooring is highly popular in rural residences because of its simple application. Oxide flooring does not come in red only; there are other colours as well, like green and grey oxide. PVC is an acronym for polyvinyl chloride, which is a kind of plastic. These tiles are light and come in measurements of 150mm, 225mm and 300mm squares. They are often glued onto a cement floor by use of an adhesive. They are neat and easy to clean. PVC tiles often lift off and may require individual replacement from time to time, so you may need to purchase an extra number. If you are looking for a non-expensive option say for a house that you wish to have tenants live in, then PVC is the way to go. PVC tiles retail in a box of 45 pieces for about 800/-. 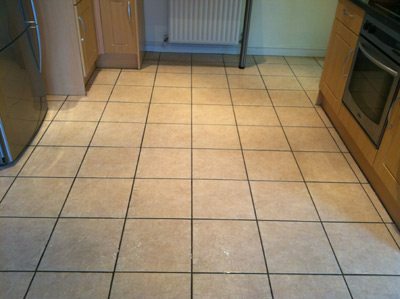 This floor type is one of the most durable and is best for hardy areas like kitchens, staircases and hallways. In non-residential areas, you may find terrazzo in factories or public halls. It is borrowed from Italian architecture. Terrazzo chips are sprinkled on a concrete surface and ground with a machine. They are then polished to a smooth finish. Dividing strips are often placed at intervals in order to prevent spreading of cracks and to form a desired pattern. These tiles are gaining popularity in urban residences in Kenya because of their trim and elegant appearance. If properly laid, ceramic tiles add a touch of class to your living spaces. They offer an array of choice in terms of colours and this does well to go with the rest of the finishing in your house. Ceramic tiles are often 12 × 12 inches in size (that is 300mm × 300mm). They are bought in cartons of 12 pieces ranging from 800/- to 1500/- per box, depending on the design and colour. A small living room of 10 ×10 feet will gobble up around 5 cartons. A mason will use a paste of pure cement and water (known as nil by builders) to lay the tiles and this may raise your budget for cement bags. There are several kinds of wood finishes to fall back on. The most common are wood blocks, high density fibre (HDF) blocks and wooden planks. These are good for living rooms and verandas. They also look nice in hallways, stairs and landings. They are, however, not favourable to wet conditions and they will require constant polishing. Wooden blocks are prone to abrasion by human traffic and furniture movement. Mazeras is a generic name given for sandstones mined from the coast of Kenya. Previously used for wall cladding, these stones are gaining popularity for use on floors. You are likely to see them being sold by the roadside, most commonly along Ngong Road in Nairobi. Because they are less slippery than ceramic tiles, mazeras are prime choice for use swimming pools, restaurant floors, gazebos and bathrooms. They cost roughly 100/- per square foot.